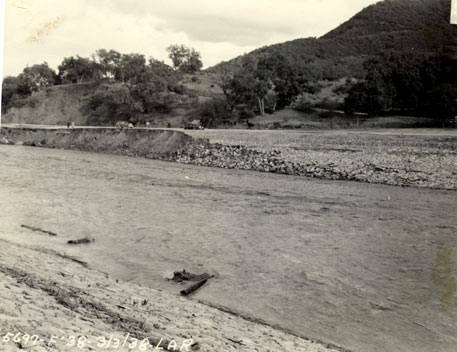 The 1938 flood event resulted in the deaths of 115 people. It destroyed 5,601 homes and damaged 1,500 homes making them uninhabitable. For many Angelenos, the storm evoked grim memories of the 1934 Los Angeles New Year’s Day flood in which 40 people, 200 homes, and 800 mostly Model “A” cars perished in the water and mud. In both storms debris flows and watery mud buried people in their homes or drowned them as they attempted in their automobiles to cross roads that had become raging torrents or cross bridges that then washed out, plunging them into the river torrents below. At least four persons were killed, hundreds of families were driven from their homes, and property was damaged to the extent of perhaps $1,000,000 in today's record rain storm. Thousands of acres of low lands were inundated, streets and highways were washed out or buried under landslides and were closed to traffic. Houses were crushed. Many street intersections in metropolitan Los Angeles were turned into lakes. Overall, the flood of 1938 was responsible for destroying 5,601 houses, damaging a further 1,500, killing upwards of 110 people, and stranding over 800 cars. Heavy silt content in floods buried roads and streets in the area, stopping traffic for many days. The Little Rock Dam nearly collapsed during the flood, while another dam in Pickens Canyon produced such large flood releases that it inundated the Roosevelt district of Lancaster. The general hospital of Los Angeles County was threatened by rising floodwaters, which had inundated the hospital power generator. More than 20 structures were destroyed in the Arroyo Seco canyon, but there were no fatalities there. The Los Angeles River reached a maximum flood stage of 380,000 cubic feet (11,000 m3) per second. 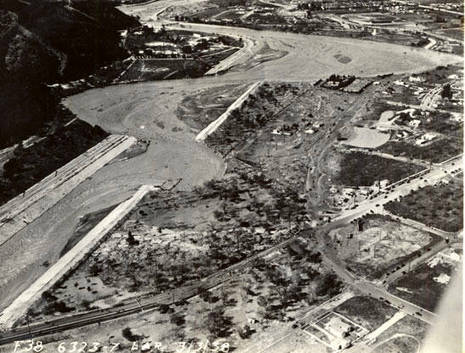 The Tujunga Wash reached its peak on March 3, 1938, with a water flow of an estimated 40,000 cubic feet (1,100 m3) per second, only after the Big Tujunga Dam had begun emergency spillway releases. 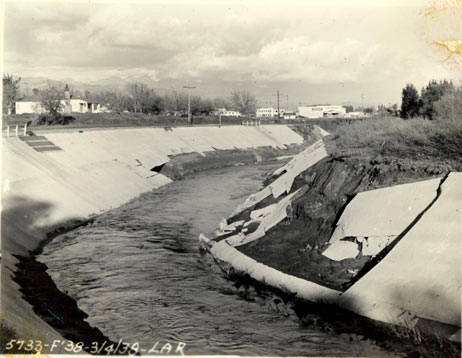 The floodwaters swept through incomplete Hansen Dam, escaped the normal channel of Tujunga Creek and flowed from Van Nuys to Lankershim Boulevard and directly into the Los Angeles River. 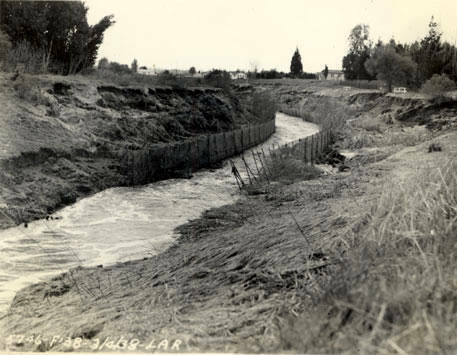 The San Gabriel River, however, was very much moderated by the extensive series of flood control dams it harbored. Releases from the San Gabriel Dam Number Two and the East Fork San Gabriel River joined to produce a flow of 100,000 cubic feet (2,800 m3) per second, which all flowed into the reservoir of San Gabriel Dam Number One. As it filled to capacity, releases of up to 60,000 cubic feet (1,700 m3) per second occurred from No. 1 into the reservoir of Morris Dam, further down on the river.